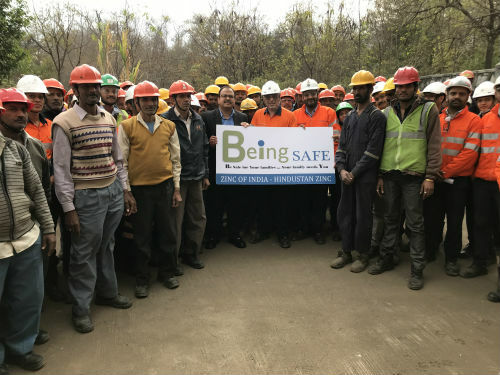 Debari: Hindustan Zinc conducted Being Safe workshop on 20th December 2017 at Zinc Smelter Debari to promote safety awareness amongst the employees. The workshop was attended by over 200 contract and regular employees of Hindustan Zinc. The workshop was undertaken by Head – Corporate Communication of Hindustan Zinc who is also the founder of Being Safe – Pavan Kaushik who interacted with the employees informally and explained to them the significance of life. The 90 minutes’ workshop comprised discussion of live case studies, screening specially crafted safety films and showcasing real life photographs of how people take their own safety for granted. “Being Safe is a scientifically designed interactive program to reduce the mind stress of the employees and bring in a sense of realization of Being Safe for their own-self and for their families”, says Pavan Kaushik. The workshop concluded with the participants taking oath of following the path of Being Safe and to make it a habit while working in the plant and outside too. Being Safe workshop has interacted with more than 2500 employees, their family members and school students of Rajasthan. Previous articleShah Rukh Khan announces the 63rd Jio Filmfare Awards 2018!